I just have to share this email from Béatrice Sabate, A Certified Positive Discipline Trainer in France. I loved watching the video even though I don't understand French. A few good news to share with all of you! 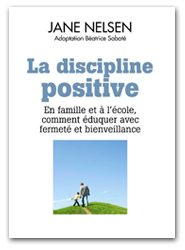 The Positive Discipline book is now published in French, there are articles in the media such as ELLE magazine; Parents magazine; psychology magazine ... the sky will be the limit. The first Positive Discipine in the Classroom Workshop will happen at the end of February and we will have our second Teaching Parenting Workshop in January. A lot of seven week parenting classes are now running. We are all focused on spreading the Positive Discipline news in this lovely country who really is in need! It's a start but it's happening. A few French educators will go to the PDC in London in order to meet Jane and see Teresa again (as she already met them in Paris). We also have a facebook page : association discipline positive france. Check out our page! It is amazing for all of us to be part of the Positive Discipline adventure. We are so grateful to all of you and your unconditional support.